With new breakthroughs in place to reach any case, L. Ron Hubbard was ready to “throw the switch” on planetary expansion. And here is where that switch connected: with a new course to present Dianetics and Scientology basics in a whole new way. It followed from the simple premise: While one can demonstrate chemical reactions or the workings of machines, how does one demonstrate the parts and phenomena of the human mind and spirit? Mr. Hubbard provides the answer, and shows how to do it with the Anatomy of the Human Mind Course. Here, then, is his onstage demonstration of the “Things of Scientology,” each as solid and real as anything in the physical sciences. As he further explained, no previous field of the mind could ever demonstrate such things as they were all “figure-figure.” Well, there’s none of that here. Not when those live demonstrations included the most colorful and lively demonstrations of any Congress—from test tubes and static electricity, to skulls and brains—all to demonstrate what is the mind and what isn’t. Moreover, here is the means for every Scientologist to show people they are a spiritual being, what the mind really is and that Scientology can help them. 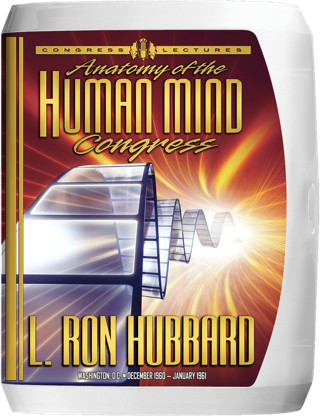 And now you know why, in asking attendees, “Where do we go from here?” L. Ron Hubbard gave the answer, “We’re going to go all the way.” For the gates had been opened to bring understanding to everyone. After years of research, he had already developed processes to reach any case and the technology to advance them to Clear. There only remained one barrier—getting the preclear in session so the technology could be applied. Such was his primary focus of 1960. And what he was addressing had everything to do with the very definition of “in session”: Interested in own case and willing to talk to the auditor. So came his startling discovery that some preclears had no interest in their own case. And without that, no case gain was even possible! Investigating further, he isolated four factors that prevented interest and, most significantly, the factor of help. In point of fact, they weren’t interested in handling their own cases because they didn’t even believe help was possible. Whereupon, Mr. Hubbard made the breakthrough on “starting cases,” with the development of Presession Processes, so called because they handled the factors necessary for a session to even begin—hence, pre session. And therein also lay the substance of what he presented as the Anatomy of the Human Mind Course. Its premise was obvious. If huge portions of the population did indeed think no help was possible, it was due in no small measure to the fact that “the world of the mind” had always belonged to the “figure-figure” of philosophy. 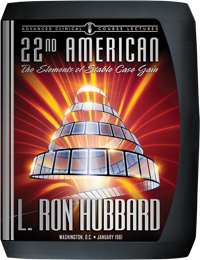 Yet, as Mr. Hubbard next presented, there were 20 items—“Things”—in Dianetics and Scientology that were as “solid as test tubes” and which could be shown and demonstrated in the physical universe. So began one of the most colorful Congresses in history. For if the Shoreham Hotel had already seen everything from Group Processing to Upper Indoctrination TRs, then here were bubbling test tubes, plastic skulls, puppets, brains, and even fires! “How far are we going to go now?